The sweet taste of summer fills this jar of Honeysuckle Jelly. It’s a mixture of summer and childhood and can be used for so many things! I know a couple of months back I was obsessed with Honeysuckle. 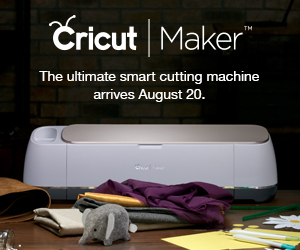 I discovered it had so many uses and I adore it in all the things. 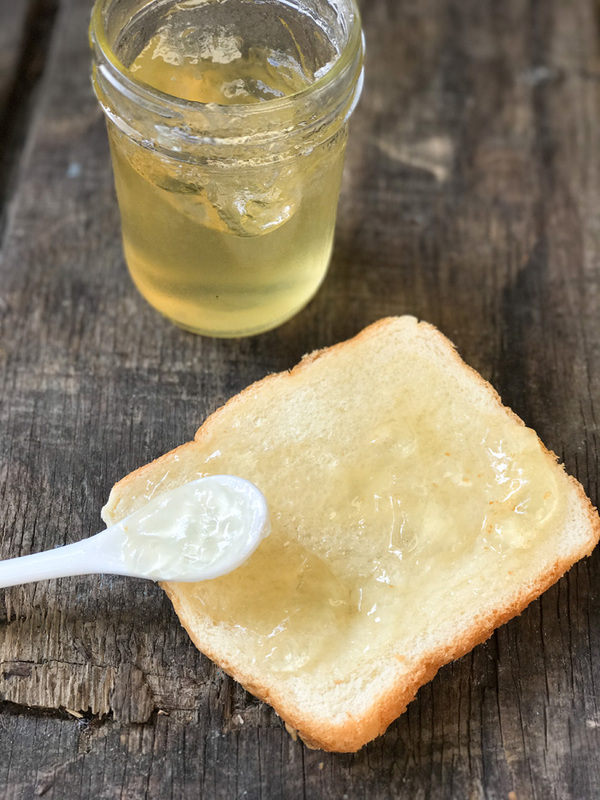 Okay maybe not everything but there are a lot of things that Honeysuckle really adds flavor too – and this Honeysuckle Jelly is incredible! 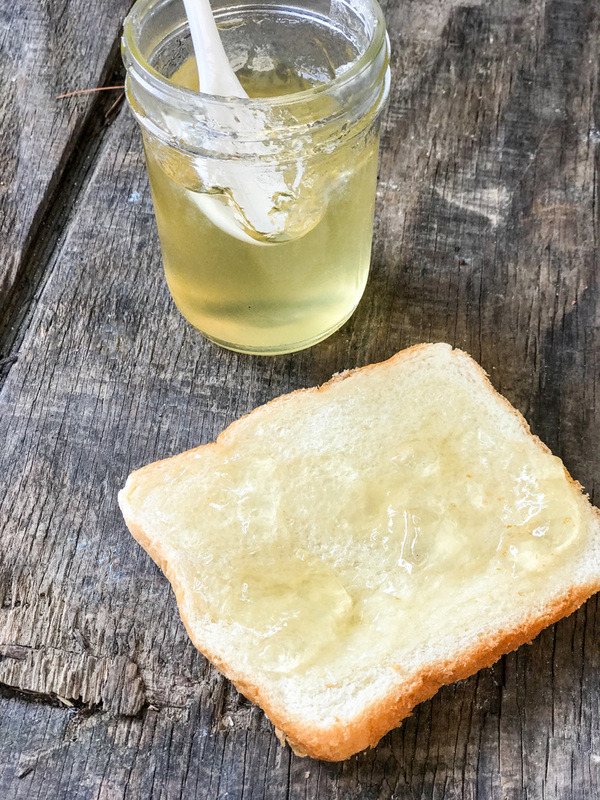 It’s a mixture between the taste of summer or the sweetness of childhood all wrapped up in a flavorful, delicious Jelly that makes some of the best sandwiches I’ve ever eaten! 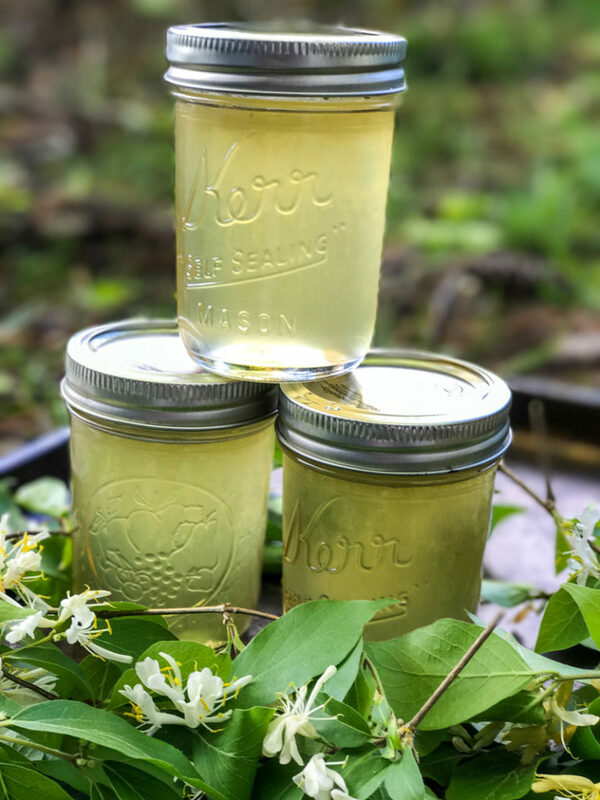 I remembered trying Honeysuckle Jelly when I was much younger, and I knew I wanted to make some. I was dying to find that flavor again. I seem to have found it with this recipe. I won’t lie, it takes a lot of those beautiful little blossoms to get a good flavor, but it’s totally worth it! I have no qualms about sticking my spoon right into that jar and taking a big old bite of that jelly straight off the spoon. And it’s not just good on bread. 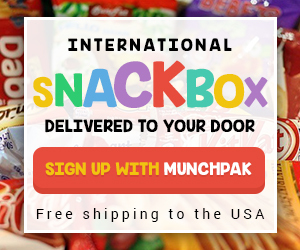 It’s great on pancakes, waffles, ice cream and more! And if you want even more honeysuckle recipes, just check out these honeysuckle recipes. 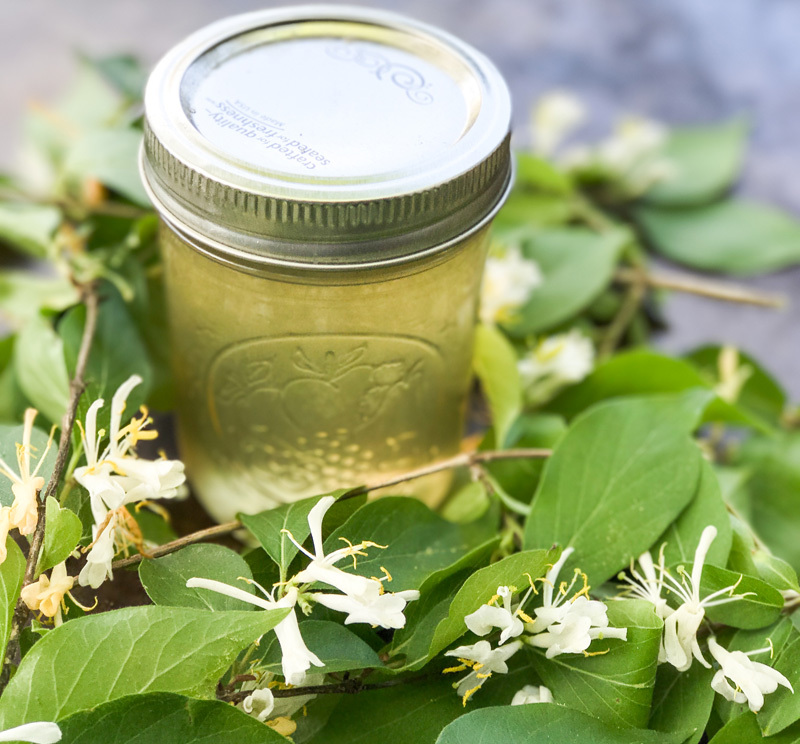 Are you ready to make your own Honeysuckle Jelly? Sweet taste of summer in a jar. Brings back childhood memories of the fragrant little blossoms and the tiny drop of nectar you placed on your tongue. Gather your honeysuckle blossoms. Remove all greens and debris. Rinse in a colander. When removing the green tips don't remove the stamen, it will pull all that amazing flavor out. 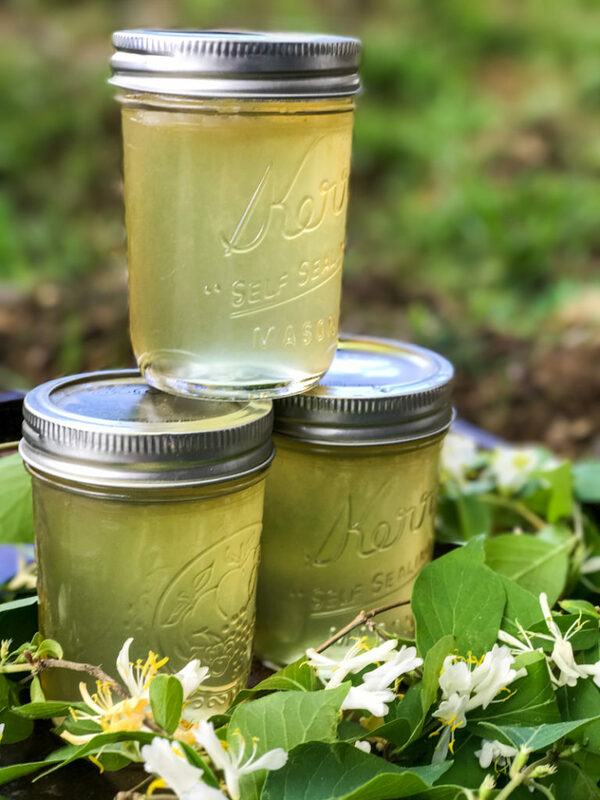 Place the honeysuckle blossoms in a tall jar or pitcher with a lid, and pour the hot boiling water over them. Allow this to sit for 12 hours (overnight). Using a sieve, strain the flowers from the Infusion Water. Heat the infusion water in a large pot on the stove until boiling. Add the powdered pectin and the lemon juice. Boil for 1 minute, stirring frequently. Stir in the sugar and heat continue heating on medium high stirring constantly. When the mixture hits 220 degrees you're done. Ladle the liquid into the jars leaving about a 1/2" of head space at the top. Seal the jar with the lids. Flip the jars upside down for about 10 minutes. Flip them upright and place in a cool, dry place for 24 hours to continue cooling. You should hear them pop when they seal. When completely cooled, be sure to test jars for proper sealing. This sounds amazing! Do you not need to put the jars in a hot bath? You can obviously, but we have yet to make this amount and not have it gone in a couple of weeks. If you double the recipe you can do that. I’ve never tried having this on my toast. Looks so light and refreshing! Thank you! It’s fabulous and so unique and different. I made this once and it was so good. 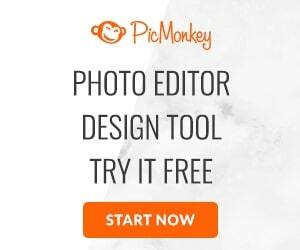 We used it for so many different things. I forgot about it last year and I think honeysuckle should be blooming soon and I need to make some again. We love honeysuckle here and we are chomping at the bit to get back out there and pull some more. Spring get here soon! Thanks for the sweet comment! We made this over the weekend and finally got to try some tonight on some biscuits and wow! I am so happy I found this recipe. There are two kinds of honeysuckle bushes.Are you using the kind pictured that are small and Bush like? We did use the ones pictured, however I can assure you our honeysuckle bushes are HUGE. Much taller than I am in most cases. I have a suspicion that you can use ANY sweet fragrant honeysuckle, so I would think the same would apply no matter what. Good luck!